In these times of economic uncertainty and political discord, when one cannot even go shopping at a suburban mall or take in a movie without feeling the need to go armed, it is reassuring to know there is one constant to life in Oregon besides the rain — that the typical beavis fan is a loser. Not only are they losers, they are the most sore and bitter losers imaginable. It struck me as odd that I would still feel the inspiration to write about beavis fan two weeks removed from the Ducks’ latest demolition of their team in the Civil War, but it is remarkable how petty they are and that bears examination. Five straight years of beatings, whether closely fought or one sided routs, have taken their toll on whatever pride “beavis nayshun” fans still possessed. In reality, beavis fan has come full circle; you just have to have been around long enough to have seen it. For those newer Ducks fans that the beavis fan calls “bandwagon,” (even as they only filled their own stadium to one-third of capacity for their make-up date with Nicholls State), a little chronology might be in order. In 1998, behind the efforts of the famous beavis slave, Kenny Simonton, the lunchpailers beat the Aloha Bowl bound Ducks 41-38 in OT. Despite finishing 5-6, the team was treated to a tractor pulled hayride and their AD put out a really unintentionally funny videotape titled, “We Own The State.” They were still mired in their NCAA record 28 consecutive losing seasons streak when they rented the state that year. The typical beavis fan was always a alternate reality fruitcake, but they were more charming and quaint back then. 1999 was really only notable for a raging fire of an RV in the Autzen Stadium parking lot during a relatively uninteresting 25-14 Ducks victory. Notably, we did not produce a “We Own The State” video, because it would be acknowledging what everyone already knew. However, beavis excitedly went on to play in the illustrious second ever Oahu Bowl, their first bowl in a generation. 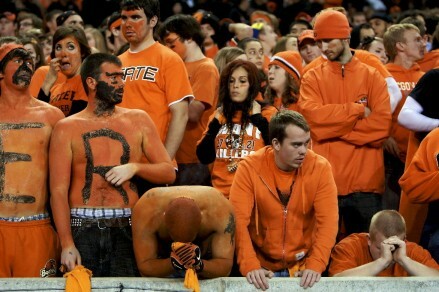 In their inimitable style, they lost the game and embarrassed the Pac-10. Oregon went on to beat Minnesota in the Sun Bowl. 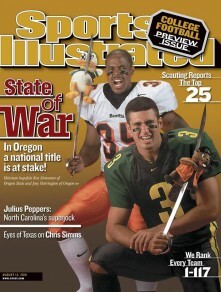 2000 was the “turning point” that I mark as the start of full blown beavis envy of the Ducks program. 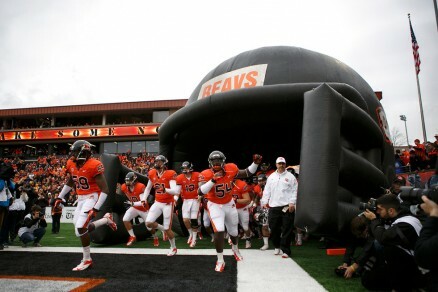 Yes, they beat us in Corvallis that season but were still only co-Champions with us. Yes, they got a better bowl bid than we did. Yes, they beat the hell out of Notre Dame while we had earlier won a close one with Texas in the Holiday Bowl. What tells though was that despite putting on a second half performance as potent as I have ever seen in a bowl game, the on-air discussion was totally dominated by how thuggish and classless the beavis team was. This turn of events was of course loudly bantered around the respective fan sites and was really a harbinger of things to come. 2001 was epically funny. If you will recall, both programs were featured on a famous Sports Illustrated cover. The magazine, foolishly in retrospect, had tagged beavis #1 in their preseason polls. More rational polls begged to differ and their sanguine view of beavis’ elite status was vindicated when the lunchpailers were completely dismantled by Fresneck State, 44-24. By Civil War time, beavis needed a victory to be bowl eligible, while the Ducks were in the top five nationally and bucking for a national title berth. We won the game in an icy rain storm 17-14, thanks to an “illegal block” that freed Keenan Howry for a game winning punt return for a TD and seal an outright Pac-10 Championship. The next five years were a period of mediocrity for both squads that saw home field be the main determinant in who took the Civil War. It was in this period that some sort of “equivalency” arguments from beavis fans began popping up. Their program had never been able to sustain the height reached in 2000, but then again, we weren’t being world beaters either. The crowing that beavis had “caught up” was in full roar after they finally took a game at Autzen in 2007 while facing our fifth string quarterback in that star-crossed season. Do Dejected beavis Fans Dream of Electric Sheep? again Mike Riley at the helm. They only needed to beat the Ducks in Corvallis to not have to depend on help from UCLA against USC. In what has to be one of the most epic home choke jobs in the history of college football with a major bowl berth on the line, the Ducks absolutely smashed beavis 65-38. All talk of “equivalence” was squelched at the final whistle of that game. In 2009, with the Rose Bowl on the line for both teams, the Ducks won a bruising contest at Autzen, 37-33, but only after “cheating” by inserting reinstated LaGarrette Blount into the line up. The dark thoughts of beavis, long suspecting Phil Knight of nefarious influence, of Mike Bellotti negatively recruiting against them, of Fred Meyer, the Oregonian, and every television station in the state all conspiring to keep beavis unpopular, finally crossed over into collective insanity. Of course, then we had a spate of off field incidents which “proved” we were a rogue program, despite beavis’ own trouble staying out of jail. We had a nationally published hit piece against marijuana thrown against the program by beavis fans, even as one of their own players said weed was a problem in Corvallis too. Finally, we are being investigated by the NCAA, which will somehow prove Eugene is a den of iniquity, while proving that OS(U) is the lone light in the ever encroaching moral darkness of NCAA football, just never you mind their perpetual problems with alcohol and racism in the “family atmosphere” over there. Then we won a national title berth on their home field in 2010. That was too much to bear and many an Auburn Tigers cap or shirt was ordered that same weekend. In 2011 we clinched the Rose Bowl on our turf. This year marks our fourth consecutive BCS bowl, a feat only dominant programs achieve. It has been said that beavis fans, by and large, hate the Oregon Ducks more than they love their own football team. For the longest time, I resisted this notion because I viewed that the evidence for such a conclusion came entirely from the nutty online fans. In the Chip Kelly era things have turned in reality too. From people I formerly regarded as sane, though afflicted with beavis fever, just this year I have heard that Kelly teaches systemic cheating, that he condones and excuses personal fouls, that he has influence over the Eugene PD and the Lane County DA, and that “Nike” makes “off the books” cash offers to recruits and/or promises future endorsement deals for signing with Oregon. No self-respect for yourselves. Who blasts a team going to the Fiesta Bowl? Who plays up going to the Holiday Bowl in comparison? I used to think this type of beavis fan was the exception, but I have been finding out he is the rule. These fruitcakes have become rancid and apparently fermented.